Flaget Cancer Center is proud to be able to provide full support and cancer care to patients in Nelson and surrounding counties. 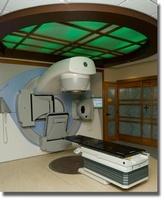 Medical Oncology and Radiation Oncology are located together in Flaget Cancer Center. The team works together to provide comprehensive care in a warm, healing environment.